BEFORE: Continuing with the teen theme but switching to horror from comedy, is Cloverfield. I’ve heard great things about this J.J. Abrams-produced film and am very interested in seeing how one of the film’s biggest draws, being told entirely in first person, plays outs. AFTER: I’m not a big fan of horror. Most of the time, horror films don’t fulfill what I see as their number one purpose; to scare. If I sit down to watch a horror film I want to jump in my seat and stay up at night afraid that a serial killer is going to burst in my room and murder me. Watching the same story over and over again with different monsters and altered plot twists doesn’t entertain me. The only other out is originality. As long as it’s original, I’ll usually forgive the scaring aspect of the film. Cloverfield was pretty high up on the originality scale. While it certainly wasn’t the first film to use the shaky, handheld camera, I’m pretty confident in saying it was the beginning of the recent influx of this style. It’s also inspired a lot of other found-footage films as well. Chronicle, Silent House, Project X, and Apollo 18 all come to mind. Not everyone is a fan of this style. Some people can apparently experience motion sickness or get a migraine from watching the film and it was widespread enough that theaters posted warnings about these effects. (This information comes from the source of all human knowledge, the wonderful Wikipedia). Personally, I’m a big fan of the shaky cam and for a film like this, I don’t see how locked-down tripod shots would work at all. The plot itself didn’t seem all that original (it seems very similar to Godzilla, but having never seen that film, I can’t really compare it). I did like some of the plot twists and especially liked the parallels with the 9/11 attacks. One of the first comments after the “earthquake” struck was, “Is this another terrorist attack?” I can’t even begin to imagine how frightening it would be for something like that to happen and I think the director, Matt Reeves, did an excellent job portraying that fear and uncertainty of living in a post-9/11 world. There are even a few familiar faces, not to this marathon, just in general. Odette Annable (née Yustman) was on the last season of House and Lizzy Caplan is of Mean Girls fame. Nothing too spectacular acting-wise from Annable, Caplan, or the others but nothing horrible either. 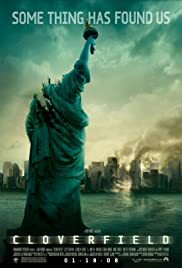 Even with not too many scares, Cloverfield is still a surprisingly good horror film. It features a highly-original style that sparked many similar films and a decent story to back it up. Personal taste however will play a big factor in whether or not you find Cloverfield entertaining.